Sometimes a behavior varies based on more than one factor. For example, let’s say that in order for the system to allow someone to be hired (returning a true from the canHire() method, perhaps), the individual in question must both be at least 18 years old and must be a US citizen. Similar to a boundary within a range, here we need more than one assert to establish the rule. However, here 2 is not enough. But should we not show that 2 and 3 combined will also produce a false? This is a perfect example of the difference between testing and specification. If we were to ask an expert in testing this question, they would likely talk about the four possible conditions here as “quadrants” and would, in fact, say that the the test was incomplete without the fourth case. In TDD, we feel differently. We don’t want to make the test suite any larger than necessary, ever, because we want the tests to run as fast as possible, and also because we don’t want to create excessive maintenance tasks when things change. The ideas of “thoroughness” and “rigor” that naturally accompany the testing thought process become “sufficiency” in TDD. This probably seems like a trivial point, but it becomes less so over the long haul of the development process. Put another way, we never add a new assert or test unless doing so makes a new distinction about the system that was not already made in the existing assertions and tests. What makes non US citizens distinct from US citizens is that they will get a false when the age is sufficient. That a non-US citizen with insufficient age will get a false is no different than a US citizen, it is the same distinction. Again, TDD does not replace traditional testing. We still expect that to happen, and still respect the value of testing organizations as much as we ever have. You may also wonder “why Outer Mongolia to represent ‘some other country’? Why not something else?” We don’t really care what country we choose here, hence we named the temporary method variable “anyOtherThanUS”. Elsewhere in this book, we’ll look at other options for representing “I don’t care” values like this one. Sometimes are have boundaries that are related in a different way. Sometimes it is a matter of selecting some values across a set, and specifying that some of them must be in a given condition. If we don’t address this properly, we can seriously explode the size of our tests. This would indicate eight individual asserts. However, if we take a lesson from the previous section on “and” boundaries we note that zero probies is the same behavior (acceptance) as any one probie; it is not a new distinction and we should leave that one off. Similarly, we don’t want to show that all three being probies is unacceptable, since any two are already not acceptable and so, again, this would not be a new distinction. That would be a lot of asserts! Painful. Pain is almost always diagnostic. When something feels wrong, this can be a clue that, perhaps, we are not doing things in the best way. Here the testing pain is suggesting that perhaps we are not thinking of this problem correctly, and that an alternate way of modeling the problem might be more advantageous, and actually more appropriate. Now we can write a test with two asserts: one that uses a collection with just enough probies in it and one with MAX_PROBATIONARY + 1 probies in it. The boundary is easy to define because we’ve changed the abstraction to that of a collection. Here is another example of a test being helpful. The fact that a collection would make the testing easier is the test essentially giving you “design advice”. Making thing easier for tests is going to tend to make things easier for client code in general since, in test-first, the test is essentially the first client that a given object ever has. As such, there is little that needs to be specified about it. 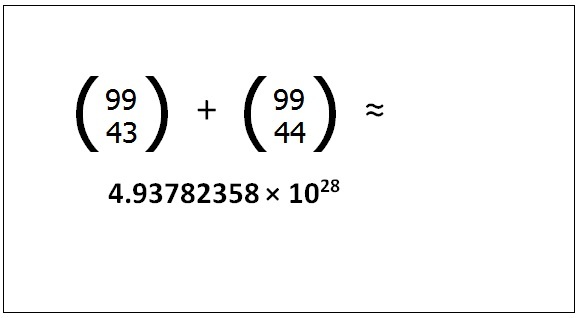 This, however is the mathematical view of the problem. In reality there’s another issue that presents itself in different ways -- the bit-limited internal representation of numbers in a computer or the way a specific library that we consider using is implemented. What happens if the sum of the arguments is more, or less than these technical limits? 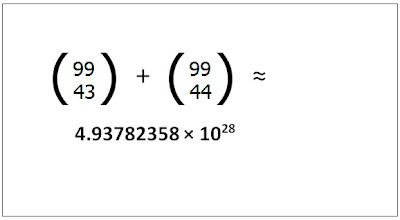 (231-1) + 1 = ? In many cases the hardware implementation will satisfy the needs of our customer. If it does not, this does not mean we cannot solve the problem. It means that we will not be able to rely on the the system’s software or hardware implementation but would need to roll our own. Surely this is a tidbit of information worthwhile knowing prior to embarking on implementation? The last assert is to document that I want to be able to have at least one value that fits in the range. What's your take on that? 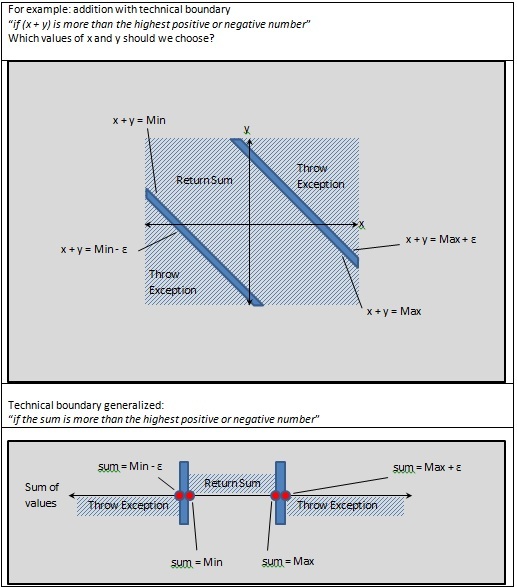 Assuming I have a behaviour description: "if given value fits in the range, X should happen" - do you even consider putting boundary values in the test, or do you encapsulate the logic of checking whether the value is in range (which sounds a bit cumbersome to me)? If you use the range values, what way to specify them do you use? Just to be more precise - what I mean by "document the range" is "how to document the relationship between the bolundaries of the range to let the test remain as generic and as descriptive as possible". E.g. when I say left = 3 and right = 5, someone may think that this behavior may be applicable if left = 3 and right = 3 when it isn't true. I do not think I completely understand the issue here, can you give us a concrete example, astral? Nonetheless, since when has not understanding something prevented anyone from giving their opinion? It does not matter where the definition of the boundaries resides - it could be in a config file, contant, or user configuration outside our control. They may even be random, for all we know. The only thing that matters, that as far as the code respecting the boundaries is concerned they exist. where minRange the smallest allowed range and maxRange is the largest. This gives you the four boundary values you need to specify to define the system's behavior. (B) What happens is the range itself, as defined by the user is incorrect? We need more tests to specify that there is a minimum and a maximum range. If minVal == maxVal, what happens? If minVal > maxVal, what happens? Note - a negative range may well be appropriate, depending on your problem domain. Thanks, Amir, you've addressed exactly the issue I meant :-). 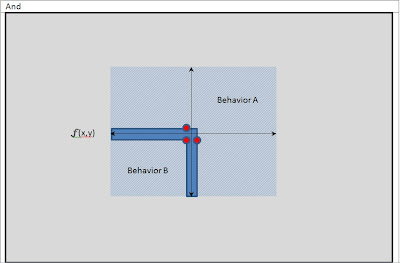 And thanks also for turning my attention to the issue that right boundary = left boundary is actually a separate behavior that should be covered in the specification.